In 1791 the area now known as Pickens County was part of the upstate’s Washington District, which also included present-day Greenville, Anderson, and Oconee Counties. By 1800 the district had been re-organized as Pendelton District and was comprised of Pickens, Anderson, and Oconee Counties, while Greenville became its own district. The district courthouse was in Pendelton. In 1828 the area was divided again, this time into Anderson District and Pickens District. The new Pickens District was named for Revolutionary War hero Andrew Pickens. A courthouse built on the western bank of the Keowee River was soon followed by the development of a town called Pickens Courthouse. The South Carolina Constitutional Convention of 1868 elected to convert the state’s districts into counties. This decision further divided the districts, and the Oconee area of Pickens District became Oconee County. 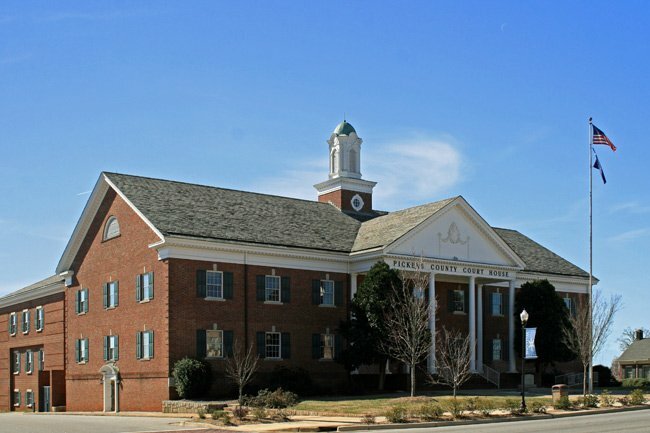 The town known as Pickens Courthouse changed its name to Pickens and moved to the town’s current site, which became the county seat of the new Pickens County. The first official courthouse of the new county was built in 1868. A second courthouse was built on the same site in 1891 and remained in use until the current one, pictured above, was completed in 1959.